In celebration of Earth Day, Wisconsin audiences will once again hear portions of conservationist and former University of Wisconsin–Madison professor Aldo Leopold’s radio addresses that originally aired more than 80 years ago on WHA, which is now a part of Wisconsin Public Radio. 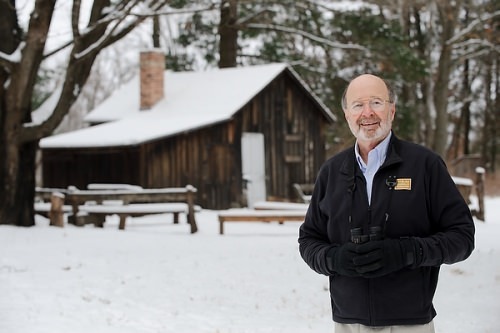 Although no known recordings of Leopold’s voice survive, UW–Madison conservation professor emeritus Stan Temple, who once held Leopold’s faculty position at the university and is now a senior fellow at the Aldo Leopold Foundation, will read excerpts from the original transcripts. 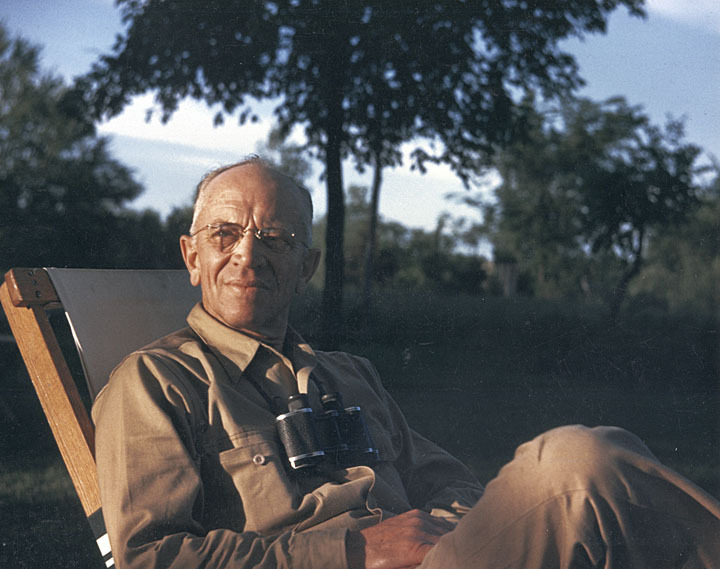 Leopold’s ideas outlined in these broadcasts went on to influence generations of conservationists and establish the science and tenets of modern wildlife management. 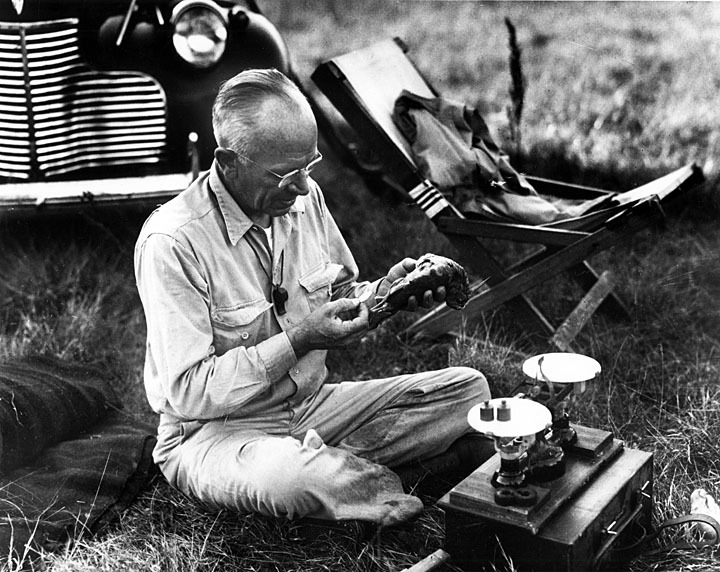 Leopold’s radio addresses were early reflections on the land ethic, his philosophy of how to live in harmony with nature, which he detailed later in “A Sand County Almanac.” They were intended primarily for farmers, using radio to reach audiences across the state in an expression of the Wisconsin Idea. In them, Leopold encouraged rural landowners to set aside and manage natural habitats to promote wildlife for both private and public benefit. The interview with Temple about Leopold’s radio addresses and his readings from the transcripts will air at 4 p.m. on Sunday, April 23, on “University of the Air” on WPR. Leopold originally presented his talks during the predecessor program, “College of the Air,” from 1933 to 1936. Excerpts will also be broadcast periodically on Wisconsin Life, WPR’s series of essays on the culture of the state. Just weeks after he joined UW–Madison as the chair on game management, Leopold turned to radio to fulfill an obligation toward outreach and extension work. 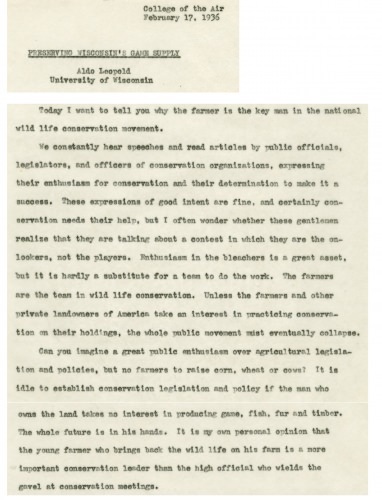 In his first address, on Sept. 8, 1933, titled “Building a Wisconsin game crop,” Leopold entreated farmers to manage their properties to sustain and increase wildlife populations. By couching wildlife management in agricultural terms of raising crops, Leopold aimed to communicate with farmers in their own language. Leopold eventually assumed the position of professor of wildlife management in what is now the Department of Forest and Wildlife Ecology in the College of Agricultural and Life Sciences. His was the first faculty appointment in wildlife management in the world. Temple says the shift from passive wildlife protection to active habitat management was revolutionary. Although Leopold’s radio addresses were recorded on fragile transcription disks, they were not maintained in central archives and have been lost. Temple is leading an effort to find any of the lost disks in hopes of obtaining what would be the only recordings of Leopold’s voice. 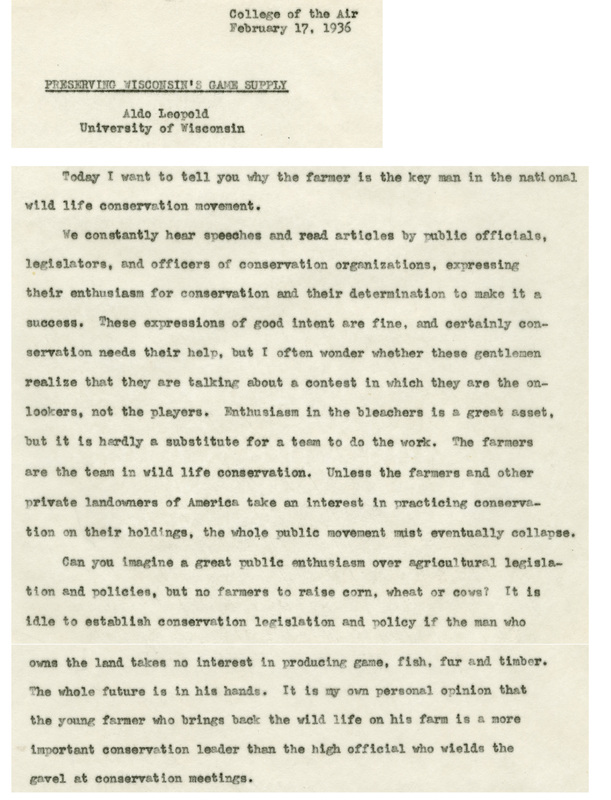 The transcripts were retained by the Department of Forest and Wildlife Ecology and can be viewed in the Leopold archives. “With it being the celebration of the 100th anniversary of Wisconsin public radio broadcasting this year, it also seems like a great chance to look back at the history of the radio station as a vehicle for education,” says Emily Auerbach, one of the hosts of “University of the Air,” of the occasion to revisit Leopold’s radio addresses. Auerbach, a UW–Madison professor of English, also teaches “A Sand County Almanac” in her course on wilderness literature. “You can see him very shrewdly in these excerpts thinking about his audience and trying to think about how to get them on board with the revolutionary idea of conservation and ecology,” says Auerbach. In the Madison area: FM 90.9, FM 107.9, FM 88.9 and WHA AM 970, the station that originally aired Leopold’s radio addresses in the 1930s. For listening in other regions of the state, look for the Ideas Network stations at the WPR website. No radio? Out of state? You can also listen live online. The archived show will be available later on the “University of the Air“ website.